Given the following API, can you think of a way that would prevent memory leaks? The problem with having something like this is that forgetting to return the buffer is going to cause a memory leak. Instead of having that I would like to have the application stop if a buffer is leaked. Leaked means that no one is referencing this buffer but it wasn’t returned to the pool. That a buffer was leaked. What was the stack trace that allocated that buffer. As you can see, utilizing ConditionalWeakTable is quite powerful, since it allows us to support a lot of really advanced scenarios in a fairly simple ways. A solution will be posted tomorrow. One of the annoying bits about Silverlight is how much of what I consider core API isn’t there. For example, concurrent collections or thread local. The fun part, it satisfies the entire contract, but I am willing to bet it is going to cause some head scratching. There is a whole set of features that require collaboration from a set of severs. For example, when talking about auto scale scenarios, you really want the servers to figure things out on their own, without needing administrators to hold their hands and murmur sweet nothings at 3 AM. We needed this feature in Raven DB, Raven MQ and probably in Raven FS, so I sat down and thought about what is actually needed and whatever I could package that in a re-usable form. I am on a roll for the last few days, and something that I estimated would take a week or two took me about six hours, all told. At any rate, I realized that the important parts of this feature set is the ability to detect siblings on the same network, being able to detect failure of those siblings and the ability to dynamically select the master node. The code is available here: https://github.com/hibernating-rhinos/Raven.SituationalAwareness under the AGPL license. If you want to use this code commercially, please contact me for commercial licensing arrangements. As you can see, we are talking about a single class that is exposed to your code. You need to provide the cluster name, this allows us to run multiple clusters on the same network without conflicts. (For example, in the code above, we have a set of servers for the commerce service, and another for the billing service, etc). Each node also exposes metadata to the entire cluster. In the code above, we share the endpoint for our RavenDB endpoint. The TimeSpan variable determines the heartbeat frequency for the cluster (how often it would check for failing nodes). We have a single event that we can subscribe to, which let us know about changes in the system topology. Discovered and Gone are pretty self explanatory, I think. But MasterSelected is more interesting. After automatically discovering all the siblings on the network, Raven Situation Awareness will use the Paxos algorithm to decide who should be the master. The MasterSelected event happens when a quorum of the nodes select a master. You can then proceed with your own logic based on that. If the master will fail, the nodes will convene again and the quorum will select a new master. With the network topology detection and the master selection out of the way, (and all of that with due consideration for failure conditions) the task of actually implementing a distributed server system just became significantly easier. Why is this not thread safe? Yes, on the face of it, this is safe code, in the sense that we will never get DuplicateKeyException. But the implementation of ContainsKey() isn’t safe to run when Add() is also executing. The actual behavior depends on the implementation, but it is easy enough to imagine a scenario where invariants that ContainsKey() relies on are broken for the duration of the Add() call. 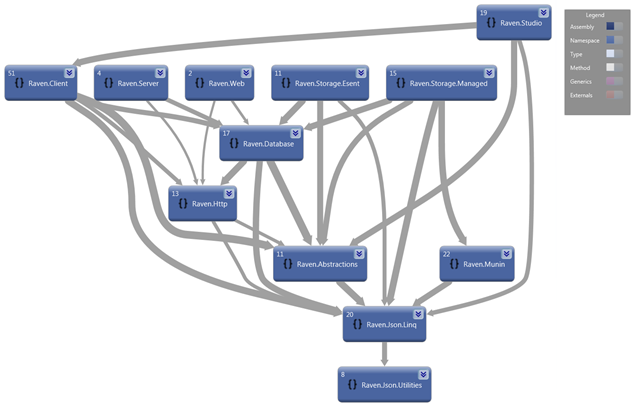 The following diagrams were generated via Visual Studio (Architecture > Generate Dependency Graph). The problem was that for backward compatibility reasons, the namespaces weren’t nearly as ordered. Mostly because we moved things around in the assemblies but couldn’t change the associated namespaces. One accusation that has been leveled at me often is that I keep writing my own implementation of Xyz (where Xyz is just about anything). The main problem is that I can get overboard with that, but for the most part, I think that I managed to strike the right balance. Wherever possible, I re-use existing, but when I run into problems that are easier to solve by creating my own solution, I would go with that. A case in point is the JSON parser inside RavenDB. From the get go, I used Newtonsoft.Json.dll. There wasn’t much to think of, this is the default implementation from my point of view. And indeed, it has been an extremely fine choice. It is a rich library, it is available for .NET 3.5, 4.0 & Silverlight and it meant that I had opened up a lot of extensibility for RavenDB users. Overall, I am very happy. Except… there was just one problem, with large JSON documents, the library showed some performance issues. In particular, a 3 MB JSON file took almost half a second to parse. That was… annoying. Admittedly, most documents tends to be smaller than that, but it also reflected on overall performance when batching, querying, etc. When you are querying, you are also building large json documents (a single document that contains a list of results, for example), so that problem was quite pervasive for us. I set out to profile things, and discovered that the actual cost wasn’t in the JSON parsing itself, that part was quite efficient. The costly part was actually in building the JSON DOM (JObject, JArray, etc). When people usually think about JSON serialization performance, they generally think about the perf from and to .NET objects. The overriding cost in that sort of serialization is actually how fast you can call the setters on the objects. Indeed, when looking at perf metrics on the subject, most of the comparisons were concentrated on that aspect almost exclusively. That make sense, since for the most part, that is how people use it. But for RavenDB, we are using JSON DOM for pretty much everything. This is how we are representing a document, after all, and that idea is pretty central to a document database. Before setting out to write our own, I looked at other options. It wasn’t really nearly as rich in terms of API and functionality. It was focused purely on reading to and from .NET objects, with no JSON DOM supported. The only input format it had was a string. The last one deserves a bit of explanation. We cannot afford to use a JSON implementation that accepts a string as input, because that JSON object we are reading may be arbitrarily large. Using a string means that we have to allocate all of that information up front. Using a stream, however, means that we can allocate far less information and reduce our overall memory consumption. Only available on Silverlight, FAIL! I literally didn’t even bother to try anything else with it. Other stuff we have looked on had those issues or similar as well, mostly, the problem was no JSON DOM available. Wait, I can hear you say, the project is open source, why not just fix the performance problem? Well, we have looked into that as well. The actual problem is pretty much at the core of how the JSON DOM is implemented in the library. All of the JSON DOM are basically linked lists, and all operations on the DOM are O(N). With large documents, that really starts to hurt. We looked into what it would take to modify that, but it turned out that it would have to be a breaking change (which pretty much killed the notion that it would be accepted by the project) or a very expensive change. That is especially true since the JSON DOM is quite rich in functionality (from dynamic support to INotifyPropertyChanged to serialization to… well, you get the point). Then I thought about something else, can we create our own JSON DOM, but rely on Newtonsoft.Json to fill it up for us? As it turned out, we could! So we basically took the existing JSON DOM, stripped it out of everything that we weren’t using. Then we changed the linked list support to a List and Dictionary, wrote a few adapters (RavenJTokenReader, etc) and we were off to the races. We were able to utilize quite a large fraction of the things that Newtonsoft.Json already did, we resolved the performance problem and didn’t have to implement nearly as much as I feared we would. The next stage was actually quite interesting, because it was unique to how we are using JSON DOM in RavenDB. In order to save the parsing cost (which, even when optimized, is still significant), we are caching in memory the parsed DOM. The problem with caching of mutable information is that you have to return a clone of the information, and not the actual information (because then it would be mutated by the called, corrupting the cached copy). Newtonsoft.Json supports object cloning, which is excellent. Except for one problem. Cloning is also an O(N) operation. With Raven.Json, the cost is somewhat lower. But the main problem is that we still need to copy the entire large object. In order to resolve this exact issue, we introduced a feature called snapshots to the mix. Any object can be turned into a snapshot. A snapshot is basically a read only version of the object, which we then wrap around another object which provide local mutability while preserving the immutable state of the parent object. If the value is on the local changes, we use that, otherwise if the value is in the parent snapshot, we use that. We have the notion of local deletes, but that is about it. All changes happen to the LocalChanges. What this means, in turn, is that for caching scenarios, we can very easily and effectively create a cheap copy of the item without having to copy all of the items. Where as cloning the 3MB json object in Newtonsoft.Json can take over 100 ms to clone, we can create a snapshot (it involves a clone, so the first time it is actually expensive, around the same cost as Newtonsoft.Json is) and from the moment we have a snapshot, we can generate children for the snapshot at virtually no cost. Overall, I am quite satisfied with it. Oh, and in our tests runs, for large documents, we got 100% performance improvement from this single change. Yes, I know, you popped this out in the middle of a debug session, after VS didn’t respond to any user input for several minutes. AYENDEPC is the local machine! You can’t lose a network connection to yourself. Oh well, we already know that Visual Studio is schizophrenic. Starting at a given time, charge as many accounts as fast as possible. Charging each account is a separate action, we don’t have the ability to do batching. What are the limiting factors. In this case, we have to make a separate request for each account. That means that we have to access a remote service, and that means we have to figure out whatever we can actually parallelize the work in any way. Most production systems would limit the number of concurrent calls that a single customer can make (to prevent a customer with a lot of servers from crashing their own systems). Let us say that we have 100,000 accounts to charge. And let us further say that the total time for a charge operation is in the order of 1 sec. What it means is that whatever we want, we are actually going to be limited by the processing capabilities on the accounts, not our own code. It would take over a day to complete. It would load a lot of data to memory, probably only to be used in several hours. It puts a lot of strain on our own database and network backbone. A better alternative would be to try to parallelize this. 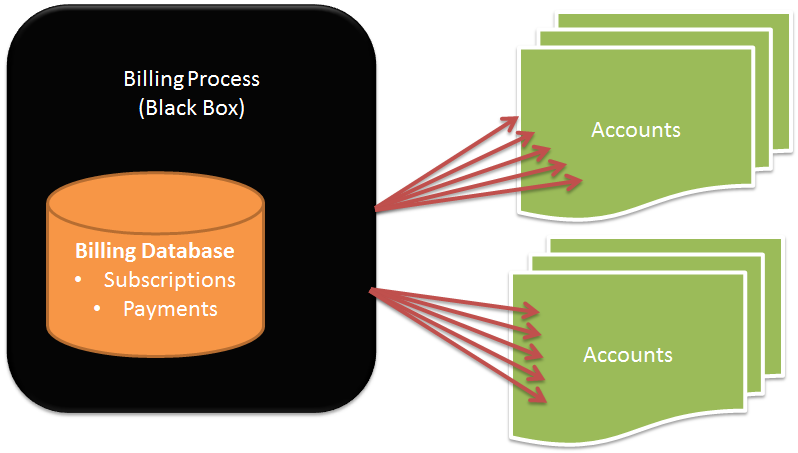 Assuming that we can perform 5 concurrent requests, we can drop the processing time to just below six hours. Note where the major savings are, not in how we are actually doing stuff with the code, but rather in how much concurrency we can agree on with the accounts provider. Just to note, let us say that they allow us 25 concurrent requests per second, we are still much better doing chunks of the data all the way rather than trying to process it all at once. What I would actually do in this scenario is just load the ids of the subscriptions that we need to update into a queue and let a bunch of workers (may be on separate machines) feed off the queue and try to handle as many account charges as they can possibly manage. As much as I rile against unbounded result set, I recently run into the first real case where “I need all of the data now” was a valid use case. The issue is charging micro payments from customers in a particular market. In that market, accounts are usually handled using prepaid codes. So you open an account and load some amount of money into it. Once that money is over, there is no way to charge the account any longer. Users will occasionally re-charge their account. Now, we are talking about recurring billing scenario, where we need to charge users every week some amount of money. So far, seems pretty reasonable, I hope. The catch is that it is pretty routine for billing to fail for insufficient funds. The strategy to resolve this is to analyze the user’s behavior and retry at likely times when we hope to catch the account with some money in it. What this means is that we will have to try to charge those accounts in that time period. To make things interesting, there are other parties as well, which probably also managed to figure out the times when most accounts have money in them. At that point, it actually becomes a race, who will be able to charge the accounts first, and get the money.